Come settle into the awe-inspiring (tidal creek-side) solar powered Swamp House on 100 acres in South Carolina's beautiful Francis Marion National Forest. 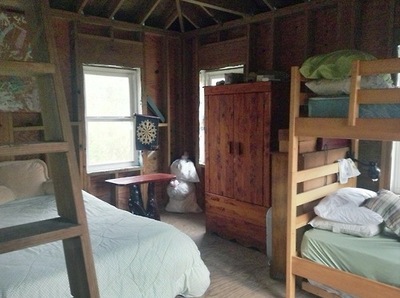 Classes, all meals, lodging, yoga, and guided tours of the wilderness area are included at Swamp Retreat. 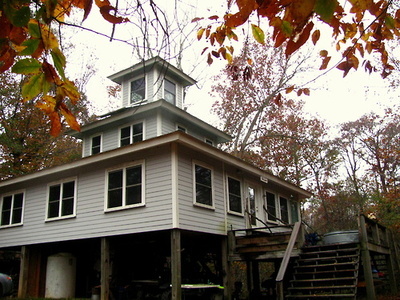 The Swamp House is located 400 feet from the tidal Echaw Creek, that flows into the Santee river 15 miles from the Atlantic. This is the bedroom on the second floor. It can sleep 4 or more if we need it to. The stairs on the left lead up to a tiny place where only one brave look-out human can sleep. Three people could sit in there and sing if they wanted to. 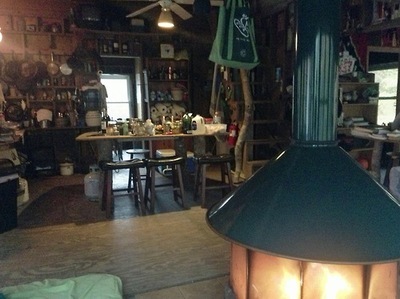 The kitchen is on the far side of the living room. If you head towards the window in the middle of this photo, there are bedrooms left and right. - Do you see the stairs next to the island there? They are steep if you are strong.